At Legacy International, we recognize the importance that entrepreneurship plays, not only in the economy, but also in society. Through encouraging the development of socialentrepreneurial endeavors that are innovative and productive, we strive to help maintain a sustainable, successful future for our children, our future generations, and ourselves. In honor of National Entrepreneurship Day (Tuesday, November 21st, 2017) we want highlight some Legacy International alumni who are working in an entrepreneurial (and invaluable) capacity in their own countries. Moises, an Emerging Young Leaders Award winner in 2017 developed a mobile app to report crime called Reach. The Emerging Young Leaders Award Program (EYLA) recognizes youth around the world for their efforts to create positive social change in challenging environments. Annually since 2016, ten leaders ages 18-24 are selected by US Embassies worldwide. They represent the power of young people to launch grassroots initiatives to improve their communities. One of the 2017 EYLA participants is Moisés Salazar. Moisés was born in Peru’s Callao province, where the provincial government has declared a state of emergency more than five times due to high levels of crime. Moisés is using technology to address the security concerns of his community. Without formal training, he created a mobile app called “Reach,” which allows users to report criminal activity in real-time, alerting other app users in the area and drawing immediate assistance in case of emergencies. “Reach” has become a network based on geolocation that connects citizens and authorities in the fight against crime to make their communities safer. In 2015, Moisés was recognized as Microsoft’s Most Valuable Professional. 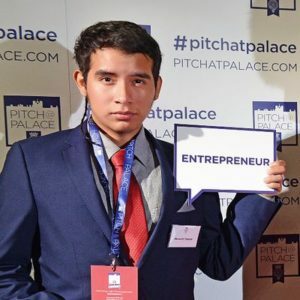 In 2016, he was invited to United Kingdom by the Duke of York to present his app in St. James Palace. Moisés continues with his work against organized crime and tries to promote campaigns against human trafficking, discrimination, and domestic violence against women. More recently, Moisés was invited by Caravan Studios to present about the importance and success of his application at the Public Good App House Festival in Washington, D.C.
Additionally, Legacy International’s Saudi Young Leaders Exchange Program (SYLEP) is a multi-phased leadership experience for Saudi university students that cultivate an entrepreneurial profile through development of workplace and personal effectiveness competencies. Muath Jaafari, a 2016 SYLEP alum, had to design a community project highlighting social entrepreneurship qualities as part of his participation in the program and his project focused on art therapy for hospitalized youth. The results of his endeavors showed improved health education and patient recovery by pairing talented young artists with patients of hospitals in Riyadh in order to contribute in pediatric patient recovery. Muath put his entrepreneurial skills to work and successfully trained and educated 15 men and women in art therapy. Moreover, he helped over 15 pediatric patients and their families through the unique combination of youth and art, while establishing name recognition for his project throughout his community, which he hopes to continue to implement in the future. Born from a passion about art, Muath realized that artists had little access to tools and materials in Saudi Arabia; thus, he ended up launching a full-scale online business to provide resources to artists so they can improve their work and teach others. Check out Hebah on Instagram. Sarah, an alumna from 2017, started a women led company that create unique abayas – her company PURRS BY LALA can also be found on Instagram. Legacy has continued to mobilize values-based, emerging leaders — giving them the skill set and support necessary to build resilient businesses and socially impactful ventures. Our upcoming Professional Fellows Program (PFP) in 2018 will focus on economic development and sustainable entrepreneurship. One alumnus of the PFP program, who has sought to be a true agent of change and continue his entrepreneurial endeavors in his country, is Hassan Aladlouni, who runs the Amal Women’s Training and Empowerment Center in Morocco. Through his work at the center, Hassan supervises the team-training program for women, while managing the restaurant that trainees work in to sell prepared meals. The Amal Women’s Training and Empowerment Center offers trainees a platform where they can enhance their capacities and earn new skills through a 6-month training program to learn all aspects of the restaurant industry. Following their training, participants will go to an internship for 4 months in the hopes of securing a job in a restaurant, hotel, Riad, or private home, that will allow them to be financially independent. We, at Legacy International, recognize the achievements of young, global, entrepreneurs, who are integrating their creativity, vision, and businesses in order to generate a positive impact on the world around them. We celebrate all of these fearless and impactful individuals on National Entrepreneurship Day, and lend our support everyday in innovative ventures necessary to meet the social and economic shifts of a rapidly changing world.